Are you looking for a Brisbane Zoo to visit with your children? There are a surprising number of good zoo’s to enjoy in South East Queensland and many within greater Brisbane. 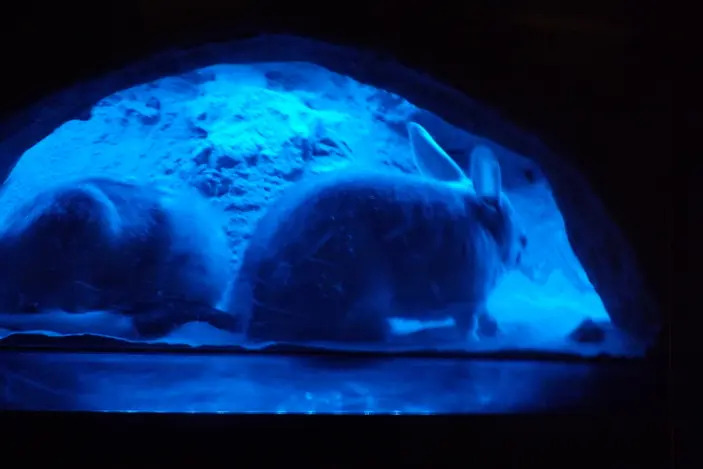 You probably know of the most popular zoos, but you might be missing out on some of the smaller zoo’s who offer something a little different. Here’s our “best of” guide to zoos, aquatic animal attractions and animal conservation centres in and around Brisbane. If the kids just want to see some big animals and maybe cuddle a koala then you will want to bookmark some of the bigger more traditional zoos Brisbane has to offer. Girl feeding Kangaroos at Queensland Zoo. Located at the Big Pineapple. One of the top ten zoos in the world, Lone Pine is most famous for its koala cuddles and up-close native animal encounters. 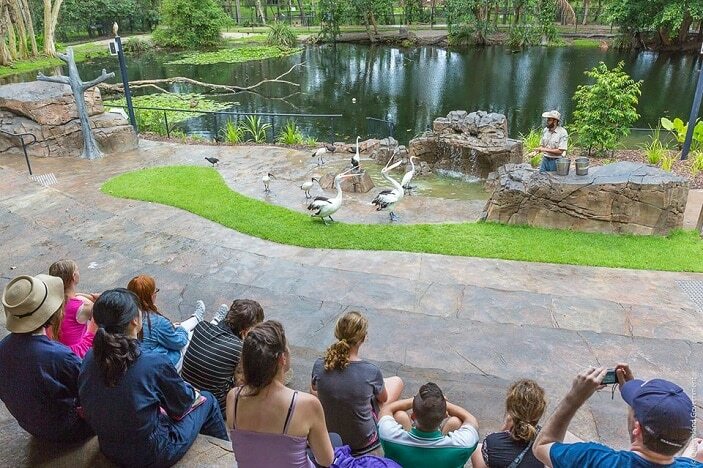 Unlike other zoos in Brisbane, it also features Aussie sheepdog exhibits, sheering, bird of prey exhibits, barn encounters and other “experiences” that you won’t find at other Brisbane zoos. Lone Pine has long been among Brisbane’s most popular tourist attractions and a must do for Brisbane families. Find out more about Lone Pine Koala Sanctuary here. Australia Zoo, just north of Brisbane is Queensland’s biggest and most high profile zoo. There aren’t many people, locals or tourists who haven’t heard of Steve Irwin’s famous crocodile attraction – but you may be surprised by the number of attractions at Australia Zoo. From rhino encounters to feeding farm animals or nursing a snake or croc – it’s a big day out for Brisbane Kids. Don’t forget your hat, and for families with small kids, older relatives or who just don’t like walking, you can see all 1000 Australia Zoo animals from the back of a buggy – but you must book in advance. If you have kids who could use a pram – take it! 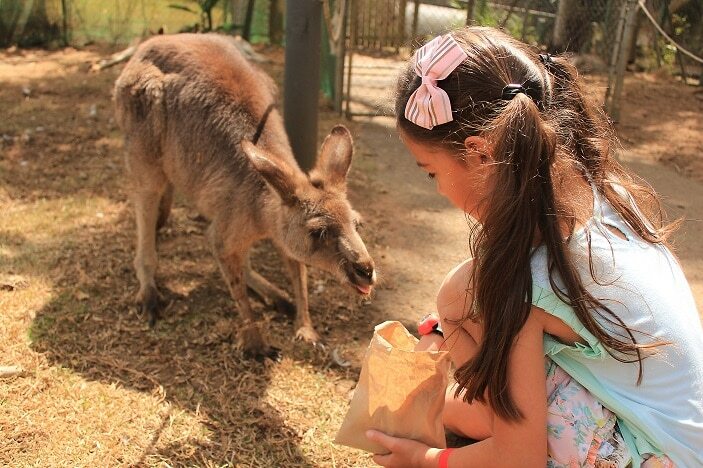 See our full review of Australia Zoo here. The Sunshine Coast’s biggest tropical landmark has recently undergone some changes. Whilst the original Big Pineapple that we know and love is still a big drawcard enticing hundreds of visitors every week to pose for that iconic photo, other exciting attractions have been added to the grounds. Families can now make a full day of their trek to Nambour, with the newly established Queensland Zoo that features lots of Australian animals and other species from all over the world in up-close enclosures, as well as roaming free within the zoo grounds. See our full review of Queensland Zoo at the Big Pineapple here. Currumbin Wildlife Sanctuary has been a popular attraction on the Gold Coast since the Gold Coast became a popular attraction! Once famous only for birds, it now boasts dozens of areas and hundreds of native animals and farm yard animals. It includes conservation sections, an animal hospital and Aboriginal cultural shows and exhibits. It’s a big day out but there are plenty of dining and show options to break up all that legwork – don’t forget your pram, hat and sunscreen! So, Dream World isn’t a zoo I hear you say….well, Dream World (and Sea World) may be two of Queensland’s biggest theme parks, but both also incorporate world-class animal attractions. Tiger Island is where Brisbane Kids go to see gigantic tigers perform a host of tricks. There are up close and personal experiences, including photo opportunities with the Tigers as well as experiences like sheep shearing, Daintree, outback and koala cuddling. If the Tigers weren’t enough to fill a nappy or two, you’ll be able to meet a few salt watercrocs, just to scare the jeebies out of your Brisbane Kid! This is a zoo turned up to 11! You can get discount tickets here. OK so once you’ve seen the crocs, the sharks, the tigers and the creepy crawlies, why not head to Sea World for some great big bears. Sea World is an amazing place to take Brisbane kids with a broad selection of sea and farm animals, many doing amazing things. You’ll love the dolphin and seal shows (and can book experiences in advance) and can book in for dozens of different adventures, from swimming with sharks, to glass bottom boat tours. Sea World is also home to some of Australia’s most respected marine biologists, zoologists and marine vets – so it’s well worth taking curious kids for some science, heavily disguised as fun. It’s a MASSIVE day out, so take the pram! Looking for a fun afternoon out, not necessarily one of those great big day trips that require more baggage than a year backpacking in Europe? For a simpler but very pleasant day at a zoo near Brisbane, these are our top picks! This is definitely one of Brisbane’s best family attractions. 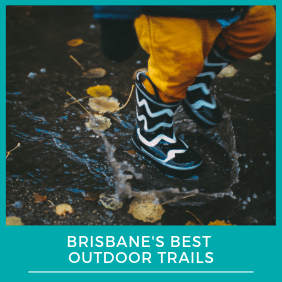 Walk About Creek is the conservation and animal rescue centre for Southern D’Aguilar National Park (aka Brisbane Forrest Park) and is a delightful day out, perfect for toddlers and grandmas! Stroll among the kangaroos and wallabies, walk under the beautiful native birds (look out for falling “good luck”) and see both furry and creepy nocturnal animals at play – all a short drive from Brisbane! Walk About Creek is extremely affordable and has dining options and an education centre. Twenty-two hectares of pretty parkland and views of pretty Ipswich architecture. 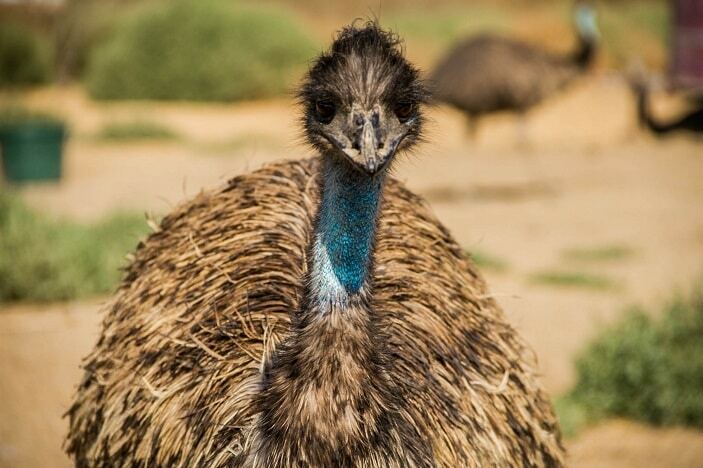 Queens Park features an array of native animals, nursery farm and a gorgeous bird aviary. It’s easily navigated with board walks and a café to stop for refreshments. While the general interest zoos get all the attention, Brisbane is host to a number of specialised animal sanctuaries. David Fleay Wildlife Park aims to show native animals in their natural environment and places a strong emphasis on conservation. David Fleay Wildlife Park is home to some of Australia’s most endangered species making it a very special place to visit. The Sunny Coast’s finest exhibit, Underwater World is an incredible place to take your Brisbane Kids. If you haven’t been, you’ll need to envisage a shark tank and aquarium several stories high, surrounded by other impressive tanks, with darkened hallways running in between. Like the name suggests, it’s very much like being in an underwater world. Kids will love the seal shows, be scared of the sharks (swimming just an inch or two of glass away) and your 1 year old will be stoked at all the ramps (I’m not kidding, it’s 1 year old paradise). See everything sea – turtles, fish, rays, sharks, coral, crawlies, otters and so much more. Underwater World is one of the best places to take your Brisbane Kids for a big day out! Tangalooma is the original Brisbane family holiday destination but in addition the beach sports and helicopter rides, it’s home to an extensive conservation program. You’ll find all manner of marine life in the tank but the real drawcard is the dolphin show. Guests of Tangalooma can provide visiting dolphins with a fishy feast every evening and take whale watching cruises in season too. 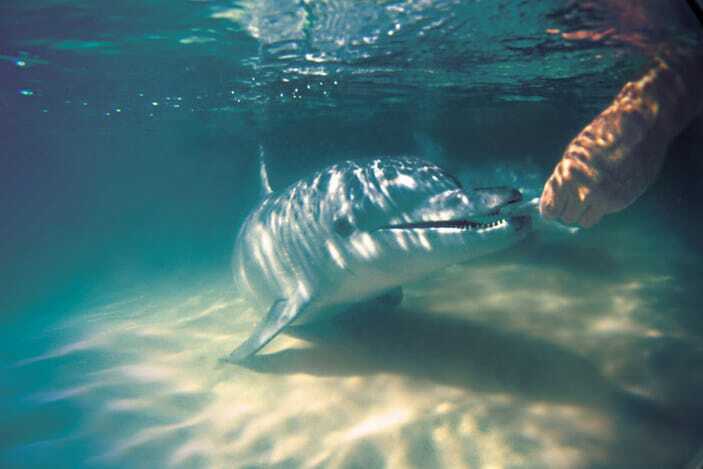 Tangalooma dolphins exhibit behaviours unlike any others in the world, including presenting staff with “thank you gifts”. It’s amazing to watch and even more amazing to get in and do! Tangalooma is a BIG day trip or a relaxing weekend away. Our tip for visiting a zoo in Brisbane or on the Coasts is to buy your tickets in advance where possible. Multi-trip tickets such as annual passes often work out cheaper than two single visits and an annual pass to an attraction like Alma Park Zoo can keep your Brisbane Kids busy every single week! Check out our theme park deals for discounted tickets.